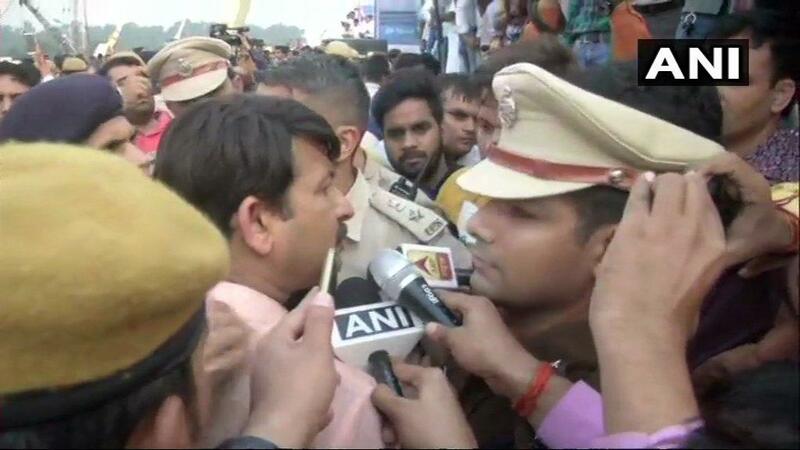 AAP MP Sanjay Singh on Tuesday accused the Delhi Police of "inaction" in dealing with those responsible for the ruckus at the inaugural function of the Signature Bridge here on Sunday and demanded that it register a case against Delhi BJP chief Manoj Tiwari. In a letter written to Delhi Police Commissioner Amulya Patnaik, he alleged that Tiwari, accompanied by Bharatiya Janata Party (BJP) workers, attempted to "physically harm" Chief Minister Arvind Kejriwal and other ministers and also "beat up and humiliated" two on-duty police officers at the event. Questioning why no case was registered against Tiwari 48 hours after the incident, the Rajya Sabha MP of the Aam Aadmi Party (AAP) said the police in the country, particularly in Delhi, worked under "tremendous political pressure". "Everything is recorded in the form of videos and photographs, still there is a strange and shocking police inaction in dealing with the culprits, who tried to disrupt a Delhi government programme and even attempted to physically harm the chief Minister and his cabinet colleagues present on stage," Singh wrote in his letter to Patnaik. He added that the matter would be raised by the AAP MPs in the upcoming Winter Session of Parliament. Delhi Home Minister Satyendar Jain has already directed the additional chief secretary (home) to lodge a police complaint against Tiwari for allegedly indulging in violence at at the event. The AAP and the BJP have filed complaints against each other, alleging assault during the event, where Tiwari had gone with scores of protesters as he was not invited to the inauguration of the bridge. Several complaints have been filed by Delhi BJP leaders in connection with the incident, including one by Tiwari, accusing AAP MLA Amanatullah Khan of shoving and threatening him. "After pushing from an elevated platform near the dais, Amanatullah Khan, in collusion with Arvind Kejriwal and others, repeatedly threatened to shoot and kill me," Tiwari alleged in his complaint to the deputy commissioner of police(north east). Leaders and workers of the BJP staged protests at many places in the city, including in front of the residences of Kejriwal and Khan. They also showed black flags to the chief minister when he had gone to attend an official event at Nand Nagri.